Show of hands, who loves homemade lasagna but hates the mess and the effort it takes to make? That’s what I thought. What if I told you that you can basically have homemade lasagna in under 45 minutes, with just one pot on the stove? Well, you can – kind of. TORTELLINI LASAGNA SOUP. If you haven’t tried lasagna soup yet, it’s amazing. It’s basically everything you’d put in lasagna, minus 5 pots and pans, layering, baking, and scrubbing a baking dish. It’s genius. 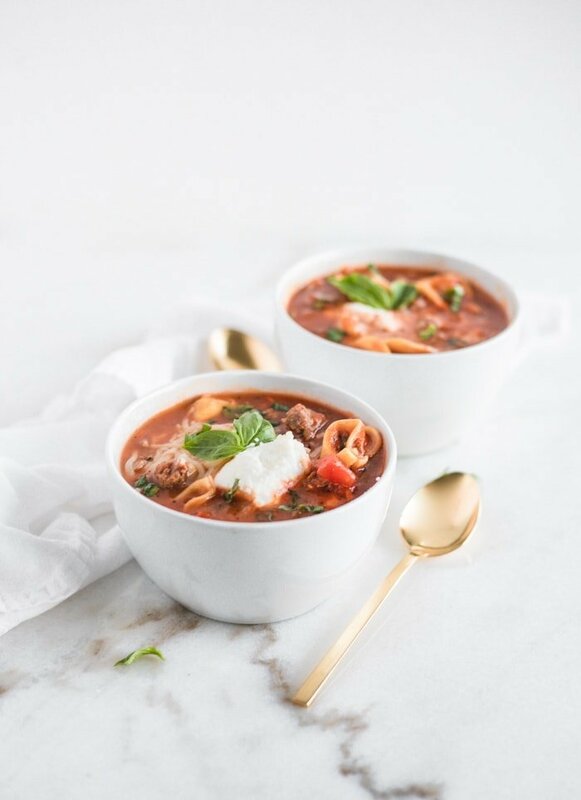 I’ve taken lasagna soup and made it even easier with this one pot tortellini lasagna soup. You literally only need one pot, and you just cook and add everything right in. There’s no draining meat or noodles, no mess, and no hassle. It’s a mom’s dream dinner. 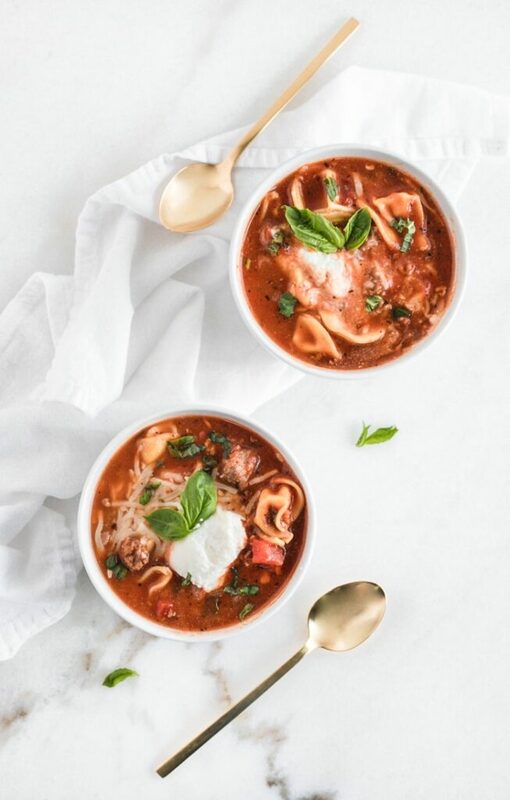 How do you make tortellini lasagna soup? Brown the meat. Use lean ground beef (or turkey or chicken) so that you don’t have to drain it. Add the onions and garlic and cook for a couple minutes. Add basically everything else besides the pasta and basil. Stir, cover and let it do it’s thing. Add the tortellini in at the end to cook. Stir in the basil just before serving. Top with ricotta and mozzarella for some cheesy deliciousness and serve. 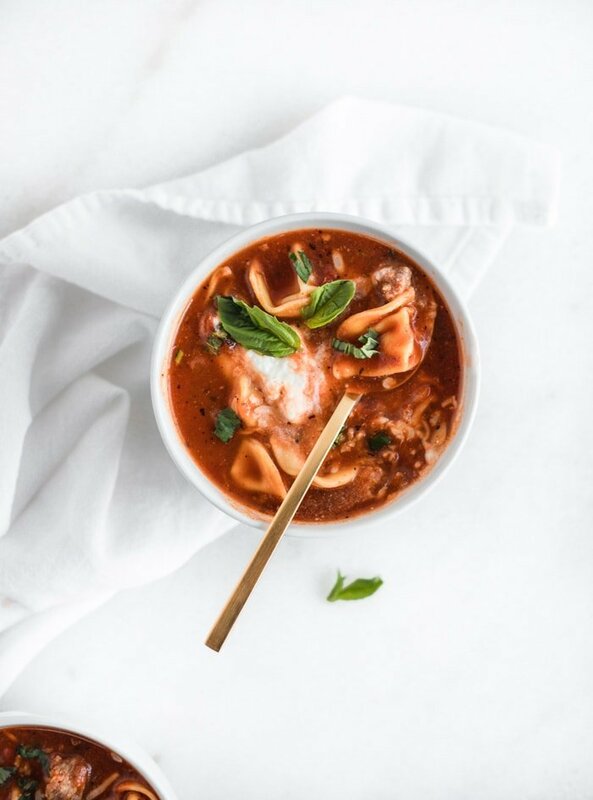 And did I mention how stinking delicious this easy one pot tortellini lasagna soup is? Like, ridiculously good. Chewy, cheesy tortellini swimming in a rich meat sauce broth, with a little herby goodness and a lot of cheesy goodness. I’m craving a bowl just thinking about it. 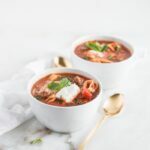 If you need a delicious, comforting, homemade pasta dinner without all of the homemade pasta dinner work, look no further than this easy one pot tortellini lasagna soup. I promise it will make it’s way into your regular dinner rotation! In a large heavy-bottomed soup pot, brown the beef over medium heat. Add the onion and garlic and cook until softened, about 5 minutes. Add oregano and tomato paste and stir to evenly distribute tomato paste. Add tomato sauce, tomatoes, broth and water. Stir, cover, and reduce heat to low. Simmer about 20 minutes. Remove lid and add tortellini. Stir and simmer, covered, about 5 minutes, or as directed on the package. Stir in basil just before serving. 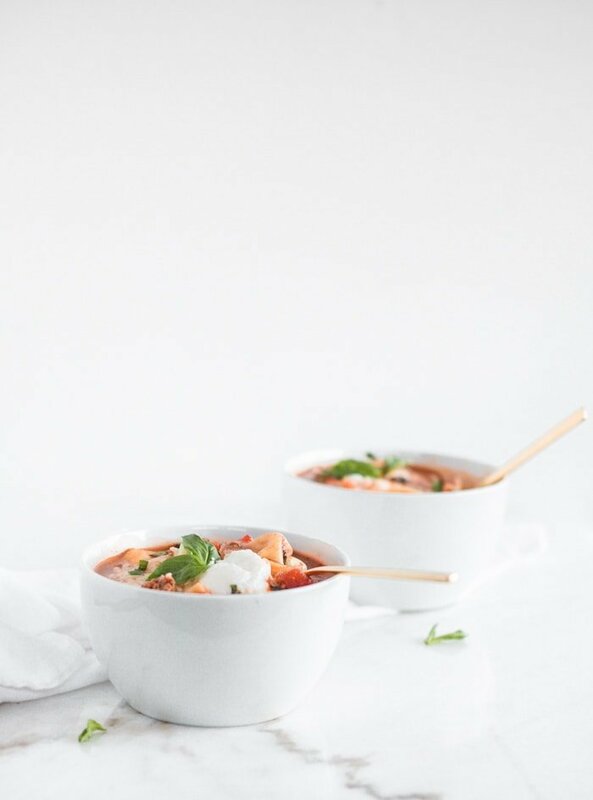 Scoop into bowls and serve with a dollop of ricotta and a sprinkle of mozzarella. The amount of salt in this recipe can vary greatly depending on the type of tomatoes and broth used. I suggest tasting it before adding the tortellini and adding salt if needed. Use ground chicken or turkey in place of ground beef, if you want. Or leave out the meat entirely for a vegetarian option.